What’s better than a barbecue on a hot summer day with friends and family? There is a technique to grilling, but you don’t have to be a professional chef to make the perfect burgers or skewers! Here are some easy-to-follow tips on how to grill the perfect summer meal. Starting off with a clean grill is a no brainer since you wouldn’t want to eat off dirty plates. A clean grill also helps preserve the integrity of the appearance and taste of the meat. Make sure to have some grilling equipment by your side such as a pair of tongs, grill brush, long-handled spatula, etc. The charcoal or gas (choice is yours) is equally as important to get that meat to be tender, juicy and succulent. Many experts recommend using a lump charcoal even though it may take a while heat up. Using charcoal helps adds a smoky flavor to the taste, the smoke from a gas grill doesn’t produce any additional flavor. Prior to grilling, be sure to prep your food. To add more taste to your food, marinate your meat for a least an hour, two hours if you really want to soak up the flavor. Skewers add the perfect touch to a barbecue, but make sure the ingredients are not on top of each other. To avoid burnt skewers, soak them in warm water for about half an hour prior to placing them on a grill. Lightly coating the veggies with oil will preserve their liquids. Don’t forget to pre-heat your grill! Without this key step, you are quite literally putting all of your food in jeopardy. This is true for two reasons. 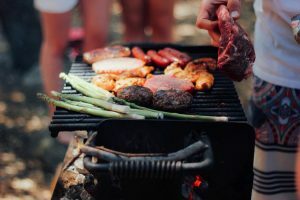 First, if your grill does not reach the optimal cooking temperature, your food will end up staying on the grill too long resulting in a overcooked and dried out meal. Second, placing uncooked food on cool grates will essentially eliminate your chance at creating flavorful sear marks. These marks are where the sugars in your food get caramelized for that delicious smoky grilled flavor we all love. First things first, make sure you grease the grates to avoid any sticking! To create the perfect taste of every food, designate your heat zones. The middle of the grill will have the highest heat and as you move towards the edges, there will be less heat. Choose wisely when it comes to where you place the food. Line up your food keeping items separated from one another. Timing is everything when it comes to getting the perfect taste. Close the grill to trap the heat but resist the urge to poke, stab, or flip your food! Trust the heat to create the perfect crust and remember how long the food has been cooking. Keeping time is important to know when to sauce your meat and when to take it out. Keep in mind that food continues to cook when off the grill. It’s best to remove the food from the grill slightly before the desired “doneness”. Don’t serve food right from the grill. Food tastes best after giving it a bit of time to rest. Doing so before cutting up the meat will allow to the juices to distribute evenly for the tender, juicy, succulent meat. Waiting can be difficult but it’s one of the most important steps in grilling. So light up your grill and get ready to impress friends and family with a delicious meal hot off the grill!